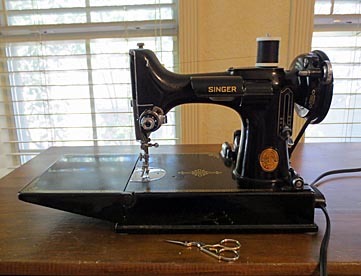 One of my favorite childhood memories is the sight and sound of my mother sewing on her Singer Featherweight. It was her opportunity to get away from it all and be creative, even for a short time. Mom was a wonderful seamstress. She made her own clothes, clothes for my siblings and me (when we were young), and, as a newlywed, shirts for my dad. OK, I think that last one was simply out of boredom. My dad was on pipeline construction in west Texas for several months. (For those unfamiliar, let’s just say, there’s not much to do in west Texas.) My mom, no doubt, was experiencing culture shock, having been born and reared in Houston! Mom sewed curtains, stitched patches to Scout uniforms and sashes, repaired rips and tears on clothing, hemmed what needed to be hemmed. I learned sewing basics on the Featherweight: threading the machine, filling bobbins, maintaining that perfect 5/8” seam allowance, and more. Mom always said the Featherweight’s attachment made the best buttonholes. Sometime in the 1960s, my dad decided my mom needed a new sewing machine. We still don’t know why. He had already added onto the house (due to the arrival of my sister), upgraded our pitiful black and white TV to color (gasp! ), and started wearing dress shirts that weren’t white (a mid-life crisis?). Now the Featherweight needed to be replaced. Mom finally acquiesced and chose a new Singer. It had a zigzag stitch, a buttonhole attachment, and these funky “cams” for creating decorative stitches. The saleslady raved about all of these features. The in-store trial, however, did not reveal its main drawback: IT DROVE LIKE A TRUCK! And it sounded like one, too. No more pleasing sounds wafting through the house. The first time I ever heard my mom audibly curse was while sewing on that machine. Machine tune-ups did not help. The stitching was just fine, the experience wasn’t. A long-distance phone call! My mom was obviously trying to contain her excitement and was failing miserably. The Singer had a mechanical problem, had been to the repair shop and…it can’t be fixed! I can just picture her dancing around the house, rummaging through the closet for the Featherweight, and restoring it to its rightful place on her sewing table. It remained there even after her death in 1996. After my dad died, the Featherweight came home to live with me. It is one of my cherished possessions. And, yes, I love to sew on it because I just like the way it sounds.